By the way, it isn't every event where the CO "dies" - gloriously I might add - in every battle! Our IMAC gun crew could be seen working both sides of the siege! 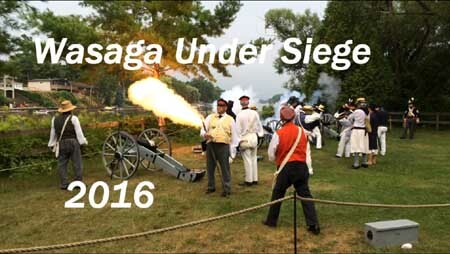 Once again Wasaga Under Siege 2016 can be classified as a Fensible Weekend Success! This year's siege also included a group entry into the Wasaga Beach 5 K Foam Fest! "Worsley's Warriors 1812 Style" headed out at 8:45 on a wet, foamy, sandy, 5k inflatable obstacle course! Meanwhile, back in camp, IMUC, IMAC, representatives of 3 different companies of the Royal Newfoundland Regiment, artisans, sutlers and period buskers informed and entertained the attending visitors on Nancy Island. The Friends of Nancy Island under the guidance of Dave Brunelle, pulled it off once again! Thanks Dave. At the same time as as Wasaga Under Siege on Nancy Island, the town of Wasaga Beach was hosting a 5 km “Foam Fest” just across the road and on the beach. 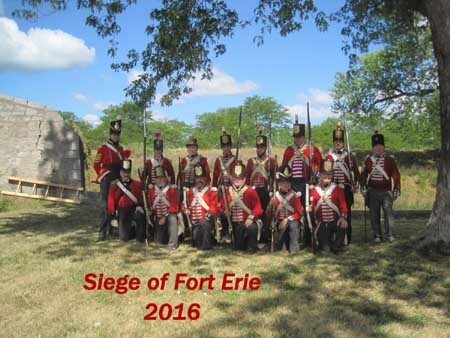 A team of 40 members representing “Worsley’s Warriors 1812 Style” participated on behalf of the re-enactors! They had a great time as they slipped, splashed, and slogged their way around the course! 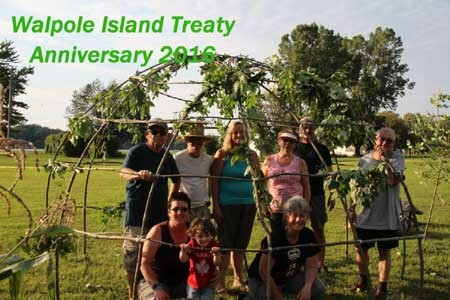 A year ago we were asked to support one of our newer members at the Walpole Island Treaty Anniversary this weekend. We arrived on the island on Friday and set up camp. One of the local elders, Preston, arrived and started placing 12 saplings in a circle. Intrigued we went over to see if he needed a hand and ended up constructing a traditional wigwam from scratch under his guidance! A patch of corn was planted next to the new wigwam and this set the stage for a skirmish which was to be part of Saturday’s program. Once the skirmish had ended, our captain, as a representative of the Crown read the original treaty that promised the local people that they would never go hungry under the protection of the king. Gifts of loaves of bread and gun powder (cartridge candies) were distributed by the soldiers to everyone present. “No one would go hungry”! as promised ! The afternoon concluded with a catered roast pig dinner, shared by everyone who attended! A Long drive, super people, and a great experience for IMUC and our Campfollowers. The IMUC Cams have reported in from Fanshawe Village - The Invasion of Upper Canada! Joe and Erin Brunt's pictures with extra help from Jacquie Durham, John Stephens, Steve Zronik and Rolf Gollin are ready! Again The Royal Scots were great hosts and the weather cooperated for the most part! Fanshawe Village can be found very near London Ontario.